Instead of connecting the pumps directly to the relay board, they can be first plugged into separate sockets that are then connected to the relay board. The water flow would generate a linear graph, using the pump alone as it pumps water at a constant rate. However, a sine curve is required in our simulator as tides rise and fall in a sine curve. The pump’s actual flow rate is significantly lesser than that stated on its packaging. When this was discovered, the codes had to be edited majorly. The new flow rate of the pump had to be calculated again each time, doing a simple assessment. If the pumps are connected directly to the relay board, they will be needed to be severed at the end so the wires are exposed and can be screwed into the relay units. This will be very troublesome as if the pumps are needed separated or need to be changed, it creates a hassle to unscrew them. Thus, instead, we resolved to making two individual sockets that can be plugged into the wall, have wires leading out of them to be screwed into the relay units and also allow the pump to be plugged into it. With this, the relay board now controls the sockets, therefore indirectly controlling the pump. The pump is without damage free and can be changed at anytime. A sine curve cannot be achieved with the pump’s fixed flow rate. To fix this issue, we had to go through with the codes on arduino. The figured coding would control the pump, making the pump switch on for several times, with a constant interval in between and the time for which it pumps each time would increase. However, this alone will not generate a regular sine curve, thus, halfway through the cycle, the pump would switch on 2 times for the same amount of time, creating a linear part on the graph so the curve resembles a sine closer. The pump flow rate decreases as usually the pump only has to pump side sideways. However, in our simulator, it would have to pump vertically. Thus, the force of gravity acting on it is stronger so more energy is required to pump the water through the pipes (Carl Villanueva J., 2009) This is why, in the same amount of time, the pump pumps lesser water than customary. Due to the fact that the pumps now have a decreased flow rate, we needed to find out their actual rate in the simulator. To do this, we filled up exactly 10 litres of water in the tank and recorded the amount of time taken to transfer that amount of water to the other tank. With the time figured out, we proceeded to convert that rate into ml/s. This way our tide simulator would work with an increased accuracy. 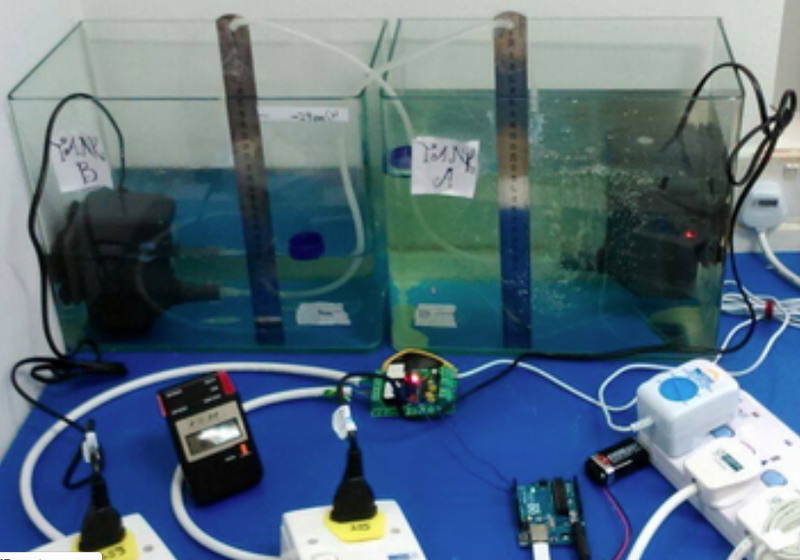 We are able to construct a tide simulator in a controlled environment with minimal materials and time. Our original ideas were much more complicated and would have taken us more time to complete. Although the pump cannot pump water to plot a sine curve on a graph, we achieved it by creating codes as desired. The sine curve resemblance has curves at the start and end and a linear part in the middle. WIthout the linear part, the graph would no longer look like a sine curve. The tank size can also be easily altered, according to the volume of water, to fit one’s needs, making the tide simulator a very flexible and convenient machine. We can place water sensors in the tanks so the each cycle would begin once the water level in one of the tanks reaches the water sensor. This does not require the owner to manually begin the cycle. Also, the water sensors would alert the owner when too much water has evaporated as the cycle would not be continued at all. This way the owner is alert of the happenings in the simulator. Bigger tanks can be brought in so the tide simulator can be constructed on a larger scale, with better and advanced pumps. Bigger pipes would also allow the flow rate of the pump to increase and thus, this would allow us to edit the codes so that the graph resembles the sine curve closer. Bigger tanks with inbuilt markers would more beneficial as having to place a ruler in the tanks can lead to inaccuracy in data collection. Furthermore, we can measure the water level at more intervals so our plotted graph would have more points and thus, be more accurate.